Raise your hand if you find yourself frequenting the fast food drive-thru on a weekly basis. Look, I get it. Feeding yourself, let alone an entire family, can be a time-consuming burden. Fast food to the rescue! BUT. 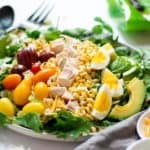 What if I told you that you can make this rotisserie chicken cobb salad recipe in under five minutes? And, no, five minutes is not an exaggeration. This dinner will be on your rotation until you’re 86 and have only the energy to make one meal a week. It’s that simple, and good! The end caps and freezer meals were piled high with packaged goods, delivering the promise of a quick fix. But they were also full of the ingredients I don’t want to be eating regularly. What I needed was a healthy and fresh option full of real, whole foods that A) could feed my whole family and B) didn’t break the bank. And that’s how the rotisserie chicken cobb salad was born. Arrange them in pretty and colorful rows, and you have yourself a winning salad! FYI, I always make my hard boiled eggs in the Instant Pot, and so should you! Click here for the tutorial on how to easily make them. It will change your life. Why rotisserie chicken in your salad? 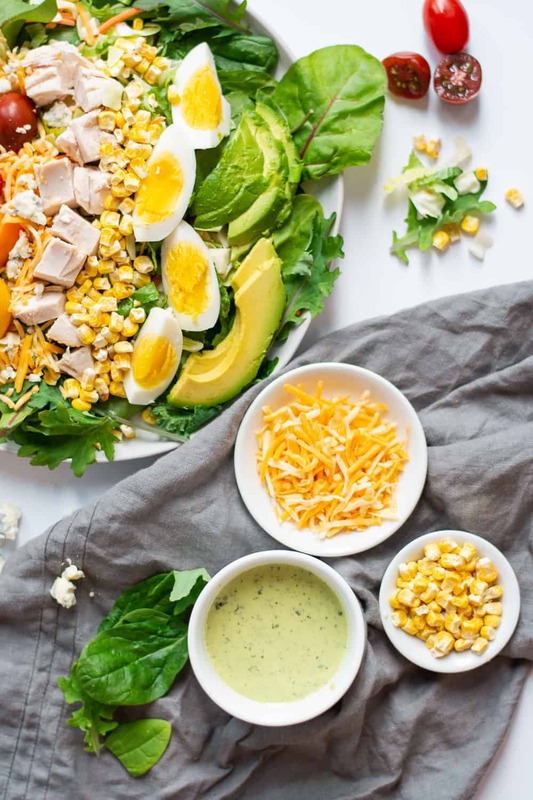 Now, get on to making this 5-minute rotisserie chicken cobb salad recipe. Grab the recipe below and enjoy! Need a healthy, quick, and easy family dinner idea? 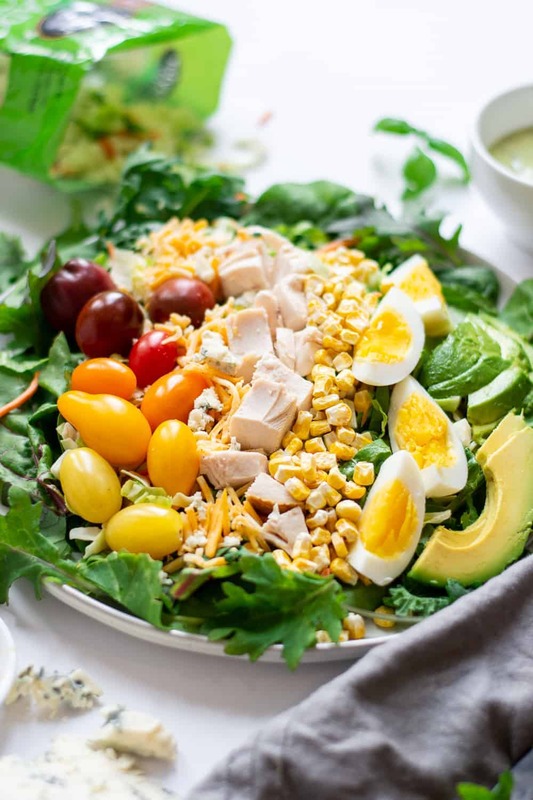 Try this 5-minute rotisserie chicken cobb salad recipe. It's a winner, winner, chicken dinner! Pour the greens from the salad kit in a bowl. 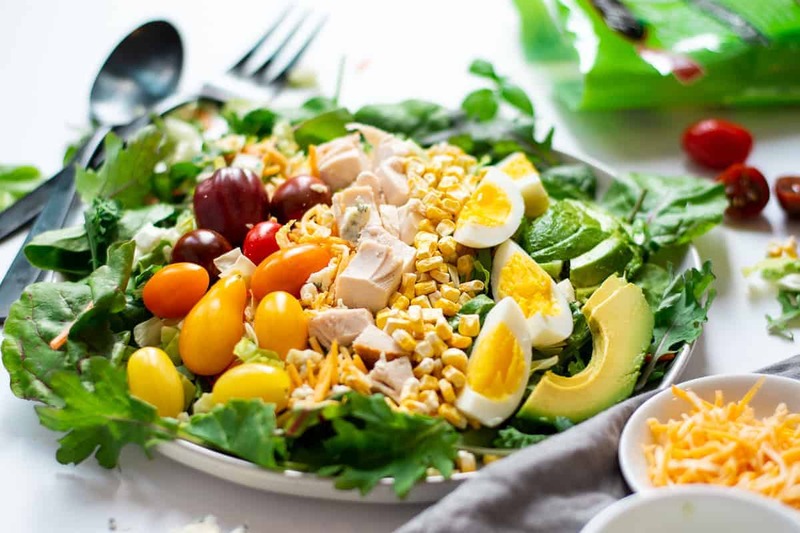 Add in the chicken, grapes, eggs, packaged toppings, and dressing.